Launched August 2nd, 2003 in Groningen, The Netherlands. 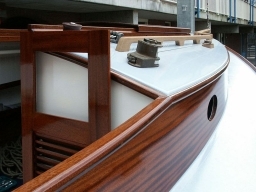 She was built by Jaap Kraayenhof over a two year period from paper plans drawn by Lyle Hess. At a weight of two tons on the trailer, she is a bit much for the Volvo wagon to tow. But the distance is short and the ramp is dry. She had a proper launch with admirers and a cup of Bubbly across the bow with a few words said about how nice it is to be done. PITCH PINE: For the sole, flooring and deck beams... this came from a never realized 16 meter project.